Jameel and JoeSettler prepare the Muqata float for the Israel Day Parade today. The White House has declared that contrary to previous reports, President Obama will not force the internationalization of the old city of Jerusalem. The bad news is that President Obama's is ratcheting up the pressure on Israel's Prime Minister, by sending US Sec. 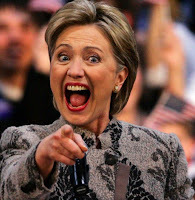 of State, Hillary Clinton to demand that Israel destroy caravans, trailer homes, and evict men, women and children from their homes in settlement outposts. 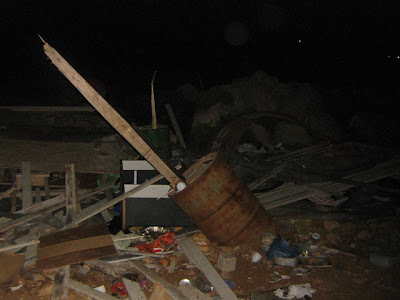 Kowtowing to Obama's decree, Israel's Defense Minister ordered Border Police shock troops to storm 2 outposts last night at 3 AM, evict people from their homes, and destroy these frail structures -- the most dangerous threat to Middle East Peace and global harmony. Global Threat Hilltop 18 (Mitzpe Avichai) before Obama's decree. 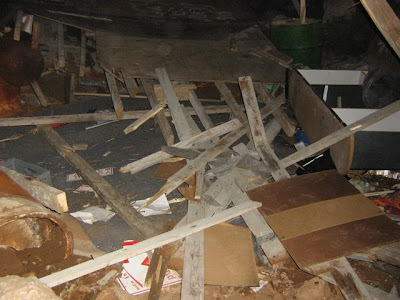 Global Threat Hilltop 18 (Mitzpe Avichai) after Israel Border Police shock troops destroy it. President Obama: Why not worry about something serious like North Korea's nuclear tests and restarting their nuclear reactor, instead of sending Hillary Clinton to impose upon Israel to destroy a bunch of trailers and evict their Jewish residents? Stay tuned for next week; exclusive Muqata video interview with hilltop residents -- whose homes are slated for destruction in the coming weeks. 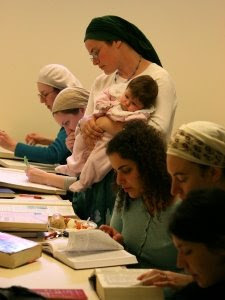 A heartwarming adoption that finally comes to fruition for the Modern Orthodox Chassid. After half an hour, we were called in. Unlike previous court appearances, which took place in a formal courtroom, this proceeding was in a small conference room with Judge Guy de Phillips at the head of the table. Sara and I affirmed that all the information we had earlier provided on our written submissions was true and correct and that there had been no material changes. The clerk then had us confirm our signatures as well as Meira’s new name. The Judge then put some stuff on the record and signed the order of adoption. We all choked back tears. Judge de Phillips said that he felt privileged to be there and to meet us. He said that in a world in which there is so much evil, loving children is an act of adoption humanity and that the more people who love children in this world, the better off we are. He said that that to raise a child is a courageous act and that adoption was an affirmation of man’s goodness. He said that, in a way, all those who are loved by their parents are “adopted,” whether their parents are birth parents or not. Finally, he said that he was 72 years old and had presided over many adoptions. This was the first time he had seen so many agency staff members present. Read it all at "Mommy, am I adopted now?" at the Jewish Star. Mazal tov -- and congratulations! Hi Gazan Readers of the Muqata! What does it mean? 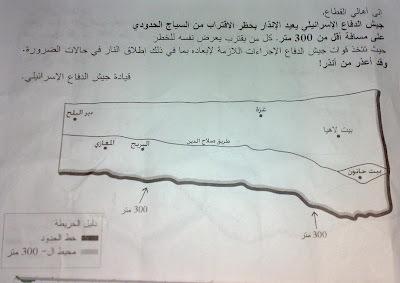 Its the distance in number of meters, that you must stay away from the security fence between Gaza and Israel. 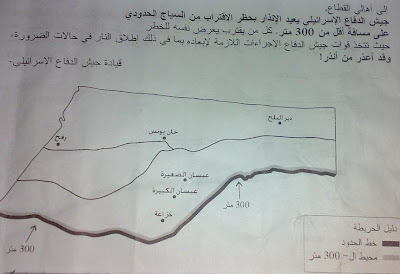 Three Hundred Meters is also, Thirty thousand centimeters! IDF forces are requiring you to stay away from the border fence and you will face serious consequences (perhaps even death) if you approach the fence. The IDF has dropped these fliers over Gaza to WARN you, to stay away! 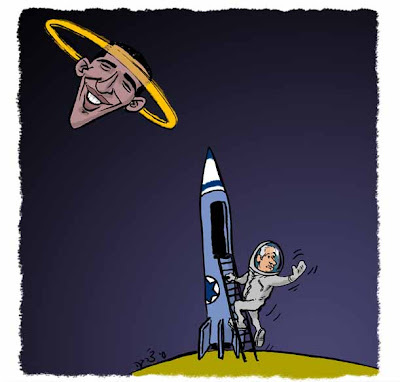 At one time, the Nobel Peace Prize was the highest moral award of our civilization. But after December 1994, when Yasser Arafat became one of the three new laureates, its ethical value was undermined. I haven't always greeted each selection of the Nobel Committee of the Storting [Norwegian parliament] with joy, but that one shocked me. And to this day, I cannot understand and accept the fact that Andrei Sakharov and Yasser Arafat, now posthumously, share membership in the club of Nobel laureates. Stephen King goes to bat for Israel...why is the planet fixated on Israel, when there are at least 70 other conflicts going on around the world? SO WHY why the obsession with Israel? It’s the only country in the world whose existence is queried is one reason. It’s the Holy Land to the world’s two largest faiths is another. That al-Qaeda sometimes backs the Palestinian cause makes Israel/Palestine strategically important – but that’s true of Chechnya, too. Maybe it’s the oil in the Middle East region that makes Arab countries important in western capitals (while distracting from their own despotism)? Could it be some wrongheaded notion of guilt for having set up Israel after the Holocaust, when actually Israel fought British imperialism for its independence? Could it be, as many Israelis believe, that we see Israelis as Jews and, therefore, as bloodthirsty sub-humans in the latest manifestation of centuries-old anti-semitism? Or is it just anti-Americanism? Perhaps it’s a little to do with each of these factors. But could it actually be that we see Israelis as very much like ourselves – sophisticated, prosperous, well-educated, fairly pale-skinned democrats? Do we hate ourselves that much? It’s either that or Israel simply isn’t deadly enough to deter the journalists too afraid to work in fly-ridden Congo. Iran starts manufacturing of a new "anti-aircraft" canon. TEHRAN (Nasdaq via AFP)--Iran launched a production line Sunday for manufacturing cannons for warships that can be used against cruise missiles, the Fars news agency reported. "The final range of the 40-millimeter naval cannon, named Fath (victory), is 12 kilometres (more than seven miles) and it shoots 300 projectiles per minute," Defence Minister Mohammad Mostafa Najjar said in a statement reported by Fars. "It can be used against cruise missiles...It is an anti-aircraft low-altitude weapon for use on warships," he said, adding that it was being entirely built by Iranians. Iran has boasted in the past of developing new weapons systems only for its claims to be met with skepticism by Western defense analysts. President Mahmoud Ahmadinejad announced Wednesday that Iran had successfully test-fired a new medium-range missile, named Sejil-2, drawing a warning from Israel that Europe too should now worry about the Islamic republic's ballistic program. How does Israel keep its spy network going in Lebanon? The Lebanon Daily Star reports its all because of "Beautiful women." BEIRUT: Beautiful women, clandestine trips abroad and a hurried escape across a mine-infested border ... All are aspects of alleged Israeli espionage networks unraveling in Lebanon and worthy of a spy novel. Nearly 20 suspected spies, including a butcher, a mobile phone salesman and a retired general, have been detained in recent months as part of a long-running probe by Lebanese intelligence into Israeli sleeper cells. And more arrests are expected, security officials say. And why are these spy network unraveling? JoeSettler has the scoop. It is well-known that the US has been supplying various Lebanese Internal Security Force with money ($1 billion since 2006), training and equipment. This money, training and equipment was supposed to go to the fight against terror and Hezbollah. It was these US backed, trained, and equipped security forces that uncovered the spy rings that were spying on Hezbollah. Ha'aretz managed to link statements by the Lebanese government indicating that these US resources went specifically to capturing the Israeli spies that were targeting Hezbollah. Hezbollah is expected to win major if not majority control in the upcoming June 6th elections. Mark my words -- the upcoming June 6th Lebanese election will be pivotal to the future of the Middle East. In a classic US State Department blunder, US Vice President Joe Biden visited Beirut to "show support for Lebanese democracy and independence". The State Department is clueless if they think that Biden's appearance in Beirut will help keep Hizbollah out of power. The US is not regarded that highly in Lebanon today, and Joe Biden's appearance will bolster anti-US sentiment and provide even more support for Hizbollah. That's not only my call. IDF Major General (reserves) Yaakov Amidror said it today on IDF Radio. Iran, Gaza, Syria...Lebanon, what's one more country that's trying to drive us into the sea? Whats sad though, is how the consensus of Israel's political spectrum has moved to the left over the past 30 years. What used to be middle of the road Zionism, such as the unity of Jerusalem and many of the themes in "Dry Bones" are now considered to be "right wing." Yaakov himself recently wrote the following about a 30 year old post on Jerusalem. Today Israel is officially celebrating Jerusalem Day! Back in 1973 this cartoon was a light joke that made folks chuckle. These days it reads like a fundamentalist manifesto. Did it make you laugh? ...or wince? ...or pound the table and shout "right on!"? And then he continues on the with following "State of Palestine Quiz". Keep up the great work, we'll keep reading! We'd like to apologize for the technical problem visitors using Internet Explorer may have experienced over the past day or two. There is apparently a bug in either Explorer or Blogger that prevents the blog from loading if the "Google Followers Widget" is located on the blog. We have removed the offending widget, and all you wonderful and patient visistors should ow be able to view the blog properly. 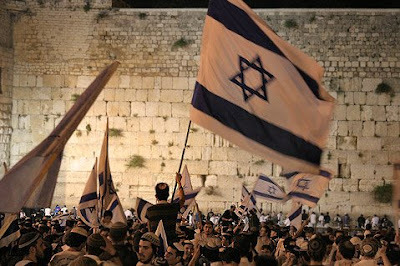 Wishing everyone a Happy Yom Yerushalayim -- Jerusalem Liberation Day. 42 years since we liberated the city, and we still need to fight for it daily. 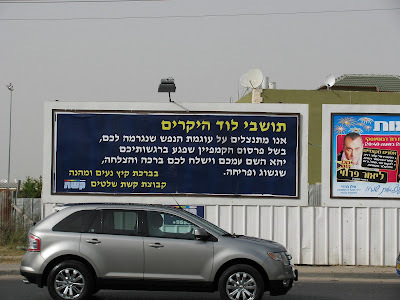 Last week, numerous readers of the Muqata blog from Israel sent me notice and photos of Missionary billboards being posted in Israeli cities around Israel, including Lod, Rechovot, Petach Tikva and others. 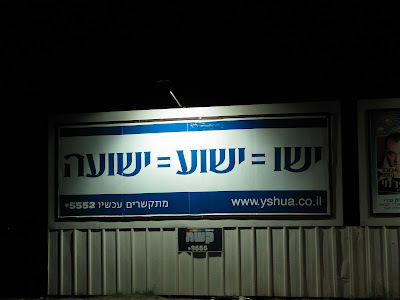 They show a Hebrew letter progression/equation from "Yeshu" (Jesus) to "Yeshu'a" (Salvation) with a web address which is a proselytizing, missionary website. 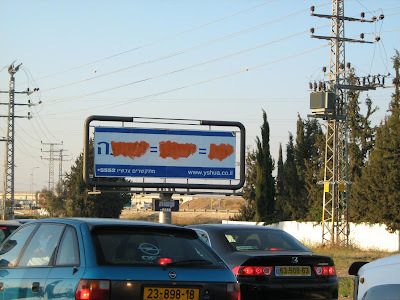 These billboards are illegal as missionary activity in Israel is forbidden under law, and they outraged many. Some of the billboards were defaced. We apologize for the anguish caused by the ad campaign which attacked your sensitivities. May G-d be with you and send you blessings, success, economic wealth, and prosperity. With blessings for a plesant and enjoyable summer. hat-tip: the Luddite and rotter. US Secretary of State, Hillary Clinton has adopted the hardest line to date against Jewish settlement growth of any US government. "We want to see a stop to settlement construction - additions, natural growth, any kind of settlement activity - that is what the president has called for"
Since when does one country interfere with another's natural growth? Who does Obama and Hillary think they are? I'm reminded of the decrees of Pharaoh in Egypt millennia ago, who demanded the cessation of Jewish births, and decreed that all Jewish male babies had to be thrown into the Nile River. Even Israel's President Shimon Peres (who I am not a great fan of) told Obama when they met 2 weeks ago, that "these [natural growth settler] children are not going to live on the roofs"
We need to expand our communities! Israel's embassy stated in response to Clinton's decree: Israel would stand by its pledge not to establish new settlements but as Israel sees it, this clearly does not include construction of housing to accommodate natural increases. "Im appaled and disgusted the Jameel put this baseless garbage on his blog and embaressed that the predictable Barak Bashers jumped on board without any self reflection. Im also disgusted to see so many of you acting like weak ghetto Jews. Obama is the president of America, not Israel. He has neither the power not the authority to "make" Israel do anything." Well then Mr. Anonymous Commenter, if Obama and Hillary don't have the "authority" to do anything, why are they demanding that Jews to stop natural settlement growth? I guess Obama didn't pay that much attention when he celebrated the "Passover seder" this year, because he missed the line from Shmot/Exodus 1:12: "But the more they [the Jews] were oppressed, the more they multiplied." 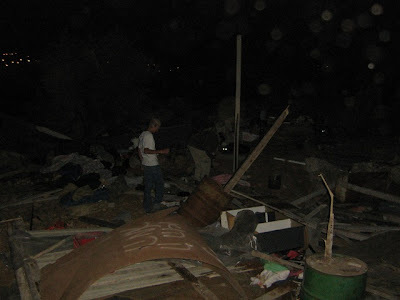 When I moved to the Shomron 16 years ago, there were 120,000 Jews in the West Bank and Gaza. We're not in Gaza anymore (for the time being), but we're now at 250,000 and growing strong. With or without Hillary Clinton and Barak Obama. The JPost reported today that two non-Jewish teenage school dropouts from Britain are now in Nof Ayalon, Israel -- participating in the filming of the BBC reality TV show, "World's Strictest Parents." The week wasn't easy for either of the youngsters, Gemma and Jack told The Jerusalem Post on Sunday. Both were quickly escorted to a mall to buy "appropriate" clothes for their new lifestyle. Jack, who describes himself as a "goth," on meeting his new family, appeared in his full-black garb, complete with heavy eye-liner, nail varnish and long unruly hair. "It was a very strict dress code," said Jack. "[When I] turned up on the first day with it on, they didn't make a big thing out of it but said 'we don't dress this way' and 'we want to change how you dress'." Gemma, who explained that she is more accustomed to "prancing around" in her bikini in hot climates, found the dress code challenging, but the change had a profound effect on her. "When they explained the reason behind it, I understood it more and wanted to give it a go," she said. "When I go back to England, I'm going to dress a lot more modestly. This could be good for my kids to see where they (and we) are in terms of the "strictness" quotient. They weren't just "following orders" -- they volunteered. A horrific page of history unfolded last Monday in Ukraine. It concerned the gruesome and untold story of a spontaneous pogrom by local villagers against hundreds of Jews in a town south of Ternopil in 1941. Not one, but five independent witnesses recounted the tale, recalling how they rushed to a German army camp, borrowed weapons and gunned down 500 Jews inside the town's Christian cemetery. One of them remembered decapitating bodies in front of the church. The man heading the research that led to this discovery discussed it in Israel last week; Father Patrick Desbois was in Pope Benedict XVI's entourage. Desbois is a French Roman Catholic priest. His team has been investigating mass executions in the former Soviet Union during the Holocaust for more than six years. 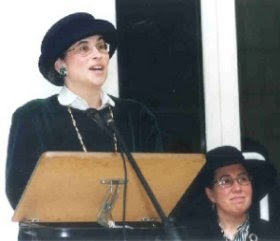 In 2004, he founded Yahad-In Unum, a Paris-based organization devoted to Christian-Jewish understanding. Oral testimonies from these events in Ukraine and Belarus are but a part of Desbois' research. Using metal detectors, his team uncovers German-made cartridges and bullets as well as victims' jewelry from killing pits. The findings are transferred to an archive in Paris, where the testimonies are translated. Earlier this year, Desbois helped start the first Holocaust masters program at the Sorbonne, focusing on the extermination in the former Soviet Union. To Desbois, there are two holocausts: a western one and an eastern one. The western holocaust was more organized, whereas the eastern one, "the one that happened away from Berlin," was chaotic, decentralized and undocumented. "German officers wanted to appear efficient, so they documented one mass grave and declared the place judenfrei. In reality, the killings went on for years," he says. "The only way of documenting these [other] graves is asking the locals. Time's running out, and we're the only organization on the ground there." The Ternopil story is not unusual because of its extreme cruelty but because it's so rare for perpetrators to openly admit playing a voluntary role. Most stories Desbois hears are from people who claim that the Germans forced them to take part in executions. "[Securing testimony from five participants in] a pogrom is a historic achievement," Desbois told Haaretz. He notes how "we couldn't have achieved this a few years ago. We didn't have the skill." He says his team's success reflects the ability to keep a poker face. "If I react with shock, it's all over," he explains. "Often I don't react at all to what the witnesses say. I just give them an interested expression and ask very technical questions about where they stood, where the victims lay, the time of day. I keep them talking and it pours out." Desbois' full-time, nine-member team includes a cameraman who films the testimonies, while the others listen to stories of murder and human degradation. But sometimes the poker face cracks, he says. For instance, when one woman described how her mother would "finish off" wounded Jews with a shovel blow to the head before burying them. "My team started to react, so I kept her talking, asking in a matter-of-fact way how exactly her mother would administer the blows." Often with local help, the Germans killed nearly 1.5 million Jews in Ukraine after their invasion of the Soviet Union in 1941. Most of that history has gone untold. Unlike in Poland, where Jews were killed in death camps, in the Soviet Union most were mowed down and dumped into open mass graves in woodlands. What is the Muqata blog? Who writes the Muqata Blog? My last question: simply, "Muqata"
It's answer: Interpreting "muqata" as "buqata"
Oh well. I'll keep checking back once in a while. Bibi Netanyahu is visiting a new American, a changed America, an America where a fellow democracy can be sacrificed to foreign ideologies and interests. True, this new vision of dictators being friends comes directly from Obama, but Obama alone couldn't have turned Israel into a Pariah state so quickly without some help. That help of course came from the newly formed anti-Israel lobby named J-Street. What does J-Street have to gain was a damaged and hurt Israel? What do they gain from weakening the Jewish State? Why would they be doing this, if supposedly they are a "Jewish" lobby? All reasonable questions which leads to a quite remarkable answer. One of the primary founders and backers of J-Street is George Soros. I've discussed Soros in the past identifying him as someone who wants to hurt the State of Israel. Soros's outright stated goal is to weaken the State of Israel and place us in a position where outside forces can dictate to us what Soros wants. Hence his involvement in the creation of J-Street. There is an eye-opening article in FrontPage Magazine that provides a litany of names of people involved in J-Street who are known for wanting to see Israel weakened and damaged (perhaps even dissolved), and their generally sick views on Israel (with of course former Israelis among them). And there is a site called DiscovertheNetworks that links all these left-wing/liberal, anti-Israel, anti-American organizations together, by discovering who is funding their activities and assisting one another. It is quite scary how interconnected and intertwined (and well-funded) these organizations are. There's apparently always a lot of money when what you hate is Israel and the Jews. Today, Israel's Prime Minister Benjamin Netanyahu is off to meet with US President Obama. As Uri Elitzur wrote in the Hebrew Weekly, Makor Rishon, this meeting isn't about personal chemistry. Charm and wit will have little to do with this meeting, as Obama has already defined his agenda and policy towards Israel. Obama has already threatened Israel not to bomb Iran's nuclear program. He has informed Israel that a "2 state" solution is the only acceptable solution for the Palestinians and Israel. State Department officials casually mention that they expect Israel to now sign the Nuclear Non- Proliferation Treaty", which changes 40 years of US policy not to publicly acknowledge Israel's nuclear program. The deck is stacked against Israel -- and Netanyahu's only cards are the will of the people of Israel who elected Netanyahu running on a platform against a "2 state" solution, and the promise of security for Israel -- that there will never be a nuclear Iran. Unfortunately, Obama's political ideology completely distorts his perception of Middle East reality. 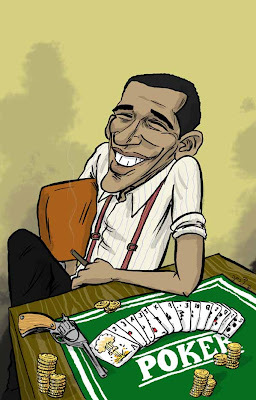 Good Luck Prime Minister Netanyahu -- we're hoping Obama isn't all smiles when you finish the poker game. 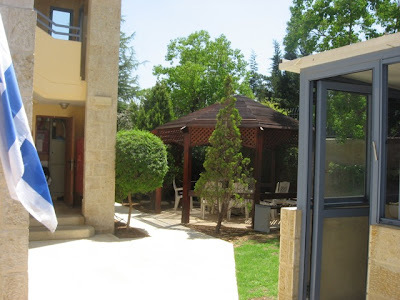 Pardes is offering a Tuition Free year in Jerusalem Israel for those who qualify! To apply for (or just learn more about) a free year at Pardes, click here. 2. Whats new with Srugim, season 2. 3. The tiyul to the top secret cave from this past Chol HaMoed. 4. Lag Baomer tiyul to Meron, 1986. 5. Giving Arafat the finger. Updated. RafiG: Here's an actual representation of the top secret cave. 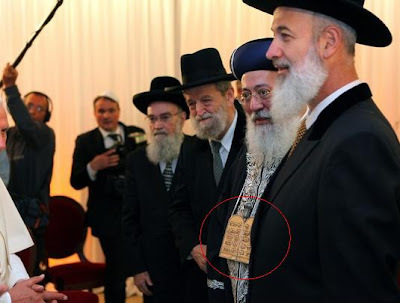 When a group of rabbis met the Pope today, the Rishon L'Zion, Sephardic Chief Rabbi Amar added distinctively Jewish symbolism to his robes -- that of the ten commandments on 2 tablets. Yes, the tablets given at Sinai were rectangular without rounded tops, but then they would be less identifiable. A Lag BaOmer round up of posts from the Muqata archives. Thesis Post: Is Lag BaOmer based on a mistake? The Kannoim attack the thesis. Two week later: Sorry, didn't mean it. The 33 Thousand Dollar Lag BaOmer bonfire. Last but not least: A word to the wise. Make sure you close your windows this evening. The smoke from Lag BaOmer bonfires gets everywhere! The Pope has landed in the Promised Land. The Ministers from the Ultra Orthodox Sephardic Shas party did not show up at the Pope's official greeting ceremony at the Ben-Gurion airport (reported on Galei Tzahal news), but then again, the same Shas ministers didn't show up on time to yesterday's cabinet meeting on-time either. Transfer Sovereignty from Israel to the Vatican? Is Shimon Peres the President of Israel, or the official emissary from the Vatican to Israel? 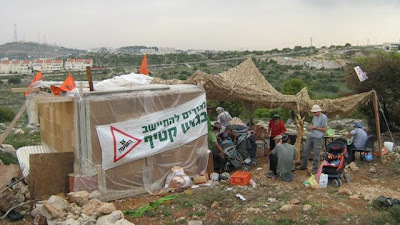 I think now would be a great time for "settler youth" to erect a new "outpost" atop Mount Tabor. Has President Peres no shame? 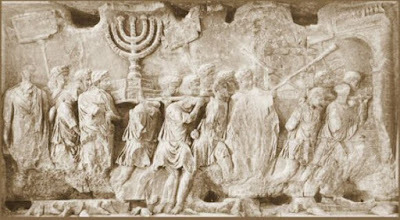 The "Sack of Jerusalem", pictured on the right is located on the "Arch of Titus" in Rome, and depicts the exile of the Children of Israel as they were brought to Rome after the destruction of the Temple in Jerusalem 2000 years ago. At least one archaeological researcher claims that the Temple Treasures are not being held by the Vatican. Dr. Sean Kingsley, author of God's Gold: The Quest for the Lost Temple Treasure of Jerusalem, has stated that the looted treasures are somewhere in the Holy Land. “One thing is for sure – it is not imprisoned deep in Vatican City,” Dr. Kingsley told the British Sunday Times in 2006. While its doubtful that the Temple Treasures are in the basement of the Vatican, its an undisputed fact that these stolen Jewish books are in fact, in the possession of the Catholic Church. Another important item that Israel should be demanding is the list of Jewish children who were housed by Christian families during the Holocaust, and converted to Christianity. These children are Jews. The Vatican's refusal to hand over this list so that these people can now be made aware of their true heritage, is a crime worthy of the Church that burned people alive during the Spanish Inquisition, for refusing to convert to Christianity. Despite the Vatican's refusal, where is the Rome of two thousand years ago and the heritage of Titus? We're here -- and they aren't. 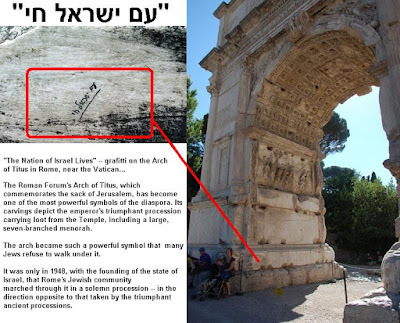 The famous Arch of Titus gained a new addition a few decades ago, as the Hebrew words, "Am Yisrael Chai" [The Nation of Israel Lives] were added to the base of the arch. The Roman Forum's Arch of Titus, which commemorates the sack of Jerusalem, has become one of the most powerful symbols of the diaspora. Its carvings depict the emperor's triumphant procession carrying loot from the Temple, including a large, seven-branched menorah. The arch became such a powerful symbol that Roman Jews refused to walk under it. Shimon Peres would be well advised to remember which country and religion he comes from. Last but not least - Jerusalem is now ensnarled in traffic, as streets throughout the city have been closed off in honor of the Pope's visit. A word to the wise: your car will be towed at your own expense if you parked it on the "wrong" street. Update: Special Mention to R' Rabinowitz, the administrative official in charge at the Kotel and Jewish holy sites in Jerusalem Rabbi of the "Kotel" (Western Wall) and Jewish holy cites in Jerusalem, for refusing to allow the police to close the Kotel to Jewish worshipers during the Pope's visit to the Wall. That's Backbone. It's called the Alisa Flatow Summer Program. hat-tip: The 1/2 April Fool...and Jameela. Getting an emergency pager message on Shabbat morning is always depressing. I usually get them for car accidents or serious medical issues that need immediate assistance, and occasionally, serious security related issues. This past Shabbat at 11 AM, I received one such pager from the national command center from Magen David Adom -- Israel's emergency medical services: Mass Casualty Event has been declared in the Negev Region...at least 10 seriously wounded...town of Rahat...as a result of a huge "brawl". Over the course of the next hour, the reports continued to flow of dozens of ambulances and mobile Intensive Care Units taking the wounded to nearby hospitals. At least 19 people were wounded by gunfire on Saturday when a family feud broke out in the southern town of Rahat. Dozens of ambulances rushed the wounded to Soroka Hospital in Beersheba, where one person was admitted in serious condition, and 12 others in moderate-to-serious condition. Another six people suffered from minor wounds. Magen David Adom paramedics evacuated the casualties wearing flak jackets and helmets, fearing for their own safety. 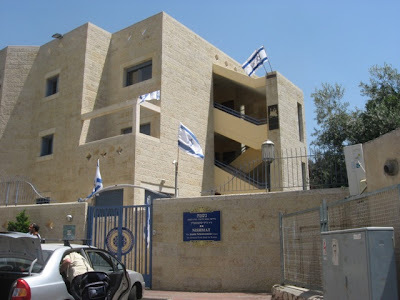 Although details of the incident are still murky, witnesses told Israeli media outlets that the violence continued for at least 20 minutes, and that rifles and handguns were primarily used. It was unclear whether some of those involved in the fighting were off-duty soldiers. The police who arrived on the scene managed to restore order, during which eight people were arrested. An investigation into the incident was ongoing, and more arrests were expected. Shortly after the incident, the mayor of the city, Faiz Abu Sabhan, strongly condemned the fighting, calling on the police to confiscate all the weapons involved. Sabhan told Israel Radio that the feud was a tragic escalation of a fight between two children from rival families over the queue at the barber shop. He said a ceasefire was achieved only following the intervention of respectable elders in the community, including himself. Police said most bullets fired came from IDF issued weapons belonging to soldiers on weekend leave. More arrests were expected. Did you catch that? 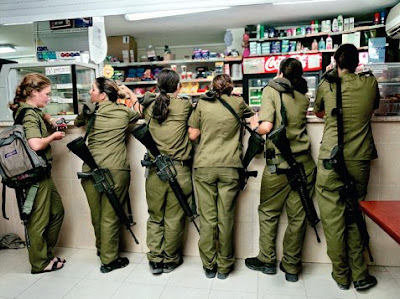 This feud involving live gunfire from IDF issues weapons, resulted from "a tragic escalation of a fight between two children from rival families over the queue at the barber shop." Is this the Middle Eastern version of Hatfields vs. the McCoys? In 1979, the two families [Hatfield and McCoys] united for a special week's taping of the popular game show Family Feud, in which they played for a cash prize and a pig which was kept on stage during the games. On June 14, 2003, on the initiative of Reo Hatfield, an actual peace treaty was drawn up and signed in Pikeville by representatives of the two families, even though the feud had ended over a century before. The idea was symbolic: to show that Americans could bury their differences and unite in times of crisis, most notably following the September 11 attacks. 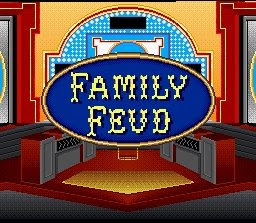 Maybe family feud wouldn't be such a good idea in Rahat. If an explosive gun battle can erupt including Bedouin IDF soldiers as a result of 2 kids fighting over a spot in a barber's shop, imagine would could happen when answering questions on a game show: What are the top 5 causes of family brawls in Rahat? I guess they wouldn't want a pig as a prize either. Hello members of the Muqata. A quick note to let you know that the latest issue of the Jewish/Israeli blogosphere blog carnival is now live. Click here and spend a few minutes sifting through it all. This is totally cool -- same panoramic photo technology as the ultra wide zoom from Obama's inauguration at the Capitol. Its not easy being a "settler" in Israel. Since the Oslo Accords and the inception of the catchphrase that settlers are an "obstacle to peace", we've had a tough time. 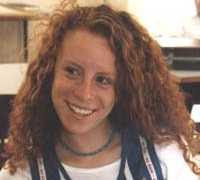 Starting September 2000, Palestinian Policemen (in addition to your run-of-the-mill Palestinian terrorists) decided to use their CIA-training and Israel-provided rifles to shoot at us on the roads, in addition to their usual rock throwing, firebombing and terrorist infiltrations into our communities. Even when we try to "do the right thing" when it comes to the environment, we still get a bum rap since the vast majority of Earth's ecowarriors are of the Left-leaning persuasion and are therefore unfortunately, anti-settler. The proud Jewish settlement communities in the Judea and Samaria/West Bank are among the forefront of organic farms for eggs, goats milk and cheese, and organically grown wheat. Our organic wineries are award winning. Solar and Wind Power for generating electricity is high on our agenda, as we explore different ways to harness the environment to produce clean energy. 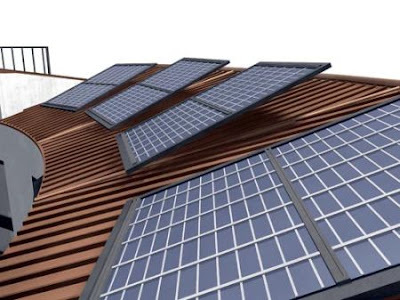 My settlement had a group (myself included) which is actively exploring the option of installing solar panels on our rooftops. 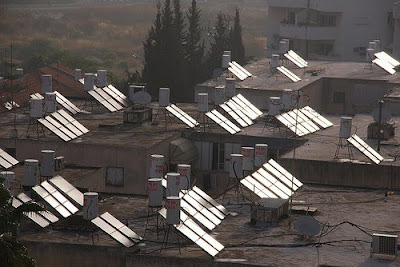 Almost every home in our settlement has had for years a passive solar powered hot water heater -- the "dud shemesh", as do many homes around Israel. We recycle paper, cardboard, and glass bottles. Plastic is a bit more challenging, but I was thrilled that upon announcing to my kids that from now on, all plastic bottles and containers would be placed in bags in the kitchen and I would bring them for recycling at work -- within a day, the "switch" was done. The kids complied without hardly any fuss at all, and about twice a week all our plastic is recycled in Jerusalem. Water recycling is a huge issue, and we're now looking at options for gray water usage to keep our lawn green during Israel's water shortage. Last but not least, security. Its no secret that our neck of the woods has its security challenges and many carry handguns "just in case." Just 2 weeks ago, a terrorist was killed during an attack in a settlement by a passerby with a handgun, thereby saving lives. Just because we carry weapons doesn't mean the environment isn't important to us. And that's why I swapped out all my Glock 19c's semi automatic's ammunition for "clean" bullets. Winchester's "WinClean" ammunition is perfect for those who require additional security but also care about the environment. WinClean bullets are "Brass Enclosed" -- thereby eliminating lead vaporization from the bullet's base and keeping my gun's barrel safe from "leading." Less lead in the environment is a serious issue, and we all do our part. If only Israel's green activists looked beyond the political borders and understood that the environment is an issue that concerns all of us, on both sides of the green line, our country, and planet would be a much better place. This is so patently offensive and stupid, I feel bad for the people who have to see this billboard on a daily basis. I spent plenty of time in Albuquerque (it was thankfully far less memorable than Manila), and the following is one of the funnier moments I had there. Big Albuquerque Southwesterner (with a cowboy hat) comes over to me in a book store in Albuquerque. him: Hey boy, I betchya that you're from Israel, arentchya? me: Why sir, you're absolutely correct! How could you ascertain that I'm from Israel? me: Well, I'm glad you were able to identify my nationality, we're proud of it. him: Ya know, you Israelees must have one heck of an education system. me: Our school's aren't that bad, how did you arrive at such a conclusion? him: Because you speak better English than I do! Not to be outdone, I called up a Kosher restaurant on the East Coast to send me some sandwiches packed in dry ice as there was hardly anything kosher to eat in Albuquerque. I asked the guy at the deli over the phone if they ship sandwiches and he proudly answered, "We ship everywhere in the United States". "Great", I answered, "Can you please ship the order to my hotel in Albuquerque, New Mexico?" He paused, and replied, "Didn't you just hear me? We only ship in the United States. We don't ship to Mexico." I stammered back, "But New Mexico is IN the United States, its one of the 50 States". He replied back full of self confidence, "I don't care if its Old Mexico or New Mexico, we don't ship to Mexico since we don't ship outside the good old USA." I asked if I could speak to the manager. He replied, "I AM the manager!" Sent to me over the internet, and up until Jameel notices and takes it down.